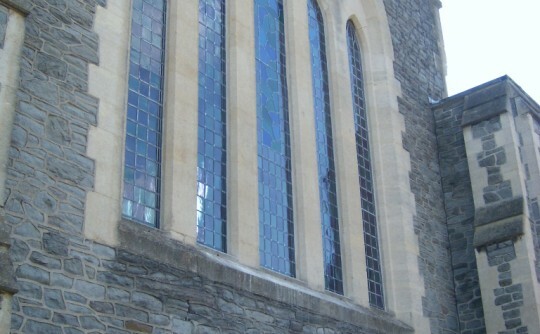 This project was carried out in conjunction with Mr Chamberlain former Managing Director of Chamberlain Builders to resolve an issue with the main leaded lights on the front of Trinity Church. The issue was that there was a cross incorporated into the 3 main leaded lights, however this was becoming increasingly difficult to see as the colour of the glass were fading and previously someone had painted the cross with black paint to enhance the cross but to no avail as the paint was now flaking off. We carefully removed the existing leaded lights and boarded the stone apertures to refurbish and redesign the 3 main leaded lights to enhance the cross. Over the next few weeks the existing glass was removed from the lead canes , cleaned, and resituated to new lead canes then re-cemented and soldered giving the leaded lights a new lease of life. With the new design of the cross in place the leaded lights were then transported to site. Boards were then removed and the new leaded lights re-installed to the Bath Stone giving a beautiful view from outside as well as inside of the new cross.